This assay has high sensitivity and excellent specificity for detection of Mouse INH-B. No significant cross-reactivity or interference between Mouse INH-B and analogues was observed. Small volumes of INH-B elisa kit vial(s) may occasionally become entrapped in the seal of the product vial during shipment and storage. If necessary, briefly centrifuge the vial on a tabletop centrifuge to dislodge any liquid in the container`s cap. Certain products may require to ship with dry ice and additional dry ice fee may apply. MBS700883 is a ready-to-use microwell, strip plate ELISA (enzyme-linked immunosorbent assay) Kit for analyzing the presence of the inhibin B (INH-B) ELISA Kit target analytes in biological samples. The concentration gradients of the kit standards or positive controls render a theoretical kit detection range in biological research samples containing INH-B. The ELISA analytical biochemical technique of the MBS700883 kit is based on INH-B antibody-INH-B antigen interactions (immunosorbency) and an HRP colorimetric detection system to detect INH-B antigen targets in samples. The ELISA Kit is designed to detect native, not recombinant, INH-B. Appropriate sample types may include undiluted body fluids and/or tissue homogenates, secretions. Quality control assays assessing reproducibility identified the intra-assay CV (%) and inter-assay CV(%). Introduction: Inhibin is a peptide that is an inhibitor of FSH synthesis and secretion, and participates in the regulation of the menstrual cycle. Inhibin contains an alpha and beta subunit linked by disulfidebonds. Two forms of inhibin differ in their beta subunits (A or B), while their alpha subunits are identical. Inhibin belongs to the transforming growth factor-beta (TGF-beta) superfamily. In women, FSH stimulates the secretion of inhibin from the granulosa cells of the ovarian follicles in ovary. In turn, inhibin suppresses FSH.Inhibin secretion is diminished by GnRH, and enhanced by insulin-like growth factor-1 (IGF-1). Inhibins have been defined based on their activity of suppressing pituitary gonadotropin secretion. Thus, the serum concentrations of Inhibin B and FSH are inversely correlated, and at low serum levels of Inhibin B, FSH concentration goes up. Inhibin B serum concentration increases gradually in the follicular phase to a broad peak at 7 days prior to the LH surge, and may constitute the limiting factor for the duration of the inter-cycle FSH rise. A decrease and a second peak follow this peak one-day past the LH surge. Most of the serum Inhibin B concentration originates from large follicles, since such follicles secrete 10 fold higher concentrations than do the small follicles. Inhibin B concentrations drop to a very low concentration at the luteal phase, and is undetectable during pregnancy. Principle of the Assay: The microtiter plate provided in this kit has been pre-coated with goat-anti-rabbit antibody. Standards or samples are then added to the appropriate microtiter plate wells with a Horseradish Peroxidase (HRP)-conjugated INH-B and antibody preparation specific for INH-B, and incubated. Then substrate solutions are added to each well. The enzyme-substrate reaction is terminated by the addition of a sulphuric acid solution and the color change is measured spectrophotometrically at a wavelength of 450 nm +/- 2 nm. 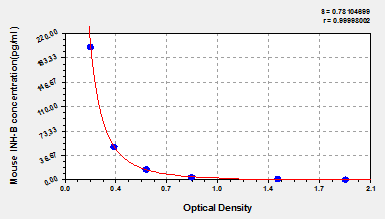 The concentration of INH-B in the samples is then determined by comparing the O.D. of the samples to the standard curve. NCBI/Uniprot data below describe general gene information for INH-B. It may not necessarily be applicable to this product. Function: Inhibins and activins inhibit and activate, respectively, the secretion of follitropin by the pituitary gland. Inhibins/activins are involved in regulating a number of diverse functions such as hypothalamic and pituitary hormone secretion, gonadal hormone secretion, germ cell development and maturation, erythroid differentiation, insulin secretion, nerve cell survival, embryonic axial development or bone growth, depending on their subunit composition. Inhibins appear to oppose the functions of activins. 1. the Activin/ALK4 pathway directly recruits PTP1B and stimulates its release from the endoplasmic reticulum through ALK4-mediated cleavage.